Welcome to our first dev log for The Legacy Games. We’ll be taking a look at what we have been working on and the improvements we have made to the game, as well as the first major zone of the game, the Undead zone. All the artwork in The Legacy Games is 2D hand drawn. We have been looking into ways to improve the artwork, making the models and environment more realistic and 3D looking. We are still exploring with the color palette to get a dark and gritty feel. We want to make the environments feel alive by adding in doodads that are either animated or have particle effects to them. (Chained cages hanging off the ceiling rocking back forth, water droplets coming from the ceiling in the sewers). Our major influence with monster design is from Xcom, where each mob is memorable, players are easily able to identify the mob’s abilities after encountering them once. We didn't want to overload each mob with abilities, a single more memorable ability is better than a mob with tons of forgettable spells. Normal mobs will have 1 ability whereas elite mobs may have 2-3 that do totally different things and synergies well with each other, as well as with its allies on the battlefield. From the design perspective, we looked at games such as Dead Space, Silent Hill and Bloodborne. 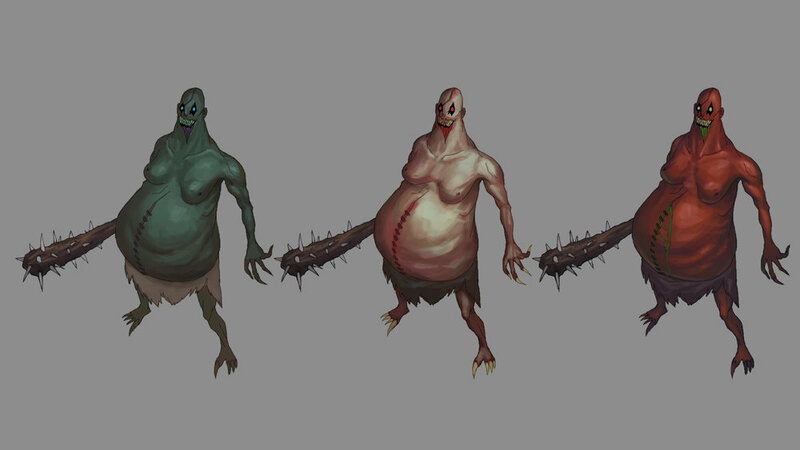 Horrific themed designs that make the player feel uncomfortable and disturbed, this ties into the story and lore behind the Undead area. We have been working on a new mini boss fight in the Undead zone, at first glance the boss itself may not look as intimidating as some of our other designs, but the idea of this boss is to mislead players thinking that it would be an easy fight. For this boss, we wanted both the boss and the environment to take a centre role. This fight will introduce the idea that the environment is not just a background, but also acts as a medium for player interaction. Players have to be wary of the enemy’s attack patterns as well as the mechanics and traps from the environment. We will explore the details of the fight in a future update.